Not a creature was stirring, not even a sceptic. In hopes that Nessie soon would be there. Okay, I couldn't get "sceptic" to rhyme, but I never claimed to be a poet. As we enter the Festive Season, I wondered if Nessie had ever added to the magic and mystery of Christmas by putting in a special appearance on Christmas Day? The answer appears to be "yes". Now as far as appearances go, December does not fare very well. After all, the tourists have all but gone, the weather is cold and the locals are pre-occupied with turkey and presents. Indeed, you could argue that Christmas Day is the least likely day to hear about the Loch Ness Monster. But we have one account and only one account in the 83 long years of monster reports and it happened on the very first Christmas of the Nessie Era in 1933. Mr. Cameron and Mr. McIntosh were driving in a motor-lorry along the Loch road (which runs close to Clayhole Bay) and caught sight of X lying about 30 yards from the shore, with its head (they considered) towards them. Mr. Cameron ran down to the shore to get a closer view; but as he did so X, apparently startled by the noise of the engine, swung very quickly round - making a great commotion in the water - and disappeared. From the disturbance created, they deduced that X's bulk below water much exceeded that of the portion visible. This showed as a dark hump about 10 feet long, and rising some 3 feet above the surface. Mr. McIntosh also noticed, about 6 feet in front of the hump, "a clear and definite break in the water," which he considered might have been produced by the head. I had never heard of Clayhole Bay before, though the location is familiar to me as denoted by the circle on the map below. Back then, the road afforded a better view as many trees had been cleared during the road widening. I suspect the foliage between road and loch is more substantial today. Now one might hear the cry of "Bah! Humbug!" from the sceptical Scrooges out there. This was clearly a standing wave caught in an eddy in the bay from a ship whose crew forgot they should have been off for the day. The fact that the creature was 30 yards from shore and unlikely to be mistaken is irrelevant say the Ebeneezers. Clearly, Mr Cameron and Mr McIntosh had indulged too much in the Christmas sherry and it was actually a duck at 1000 yards. Glad that was all cleared up, I was nearly getting too excited and gullible. Getting back to reality, this sighting is typical and classical. The large, single hump is the most common type of sighting and the mention of the creature being sensitive to noise is a familiar description. Based on the overall description, this would appear to have been at least a 20 footer. Nice. With that, I shall wish all readers a Merry Christmas! 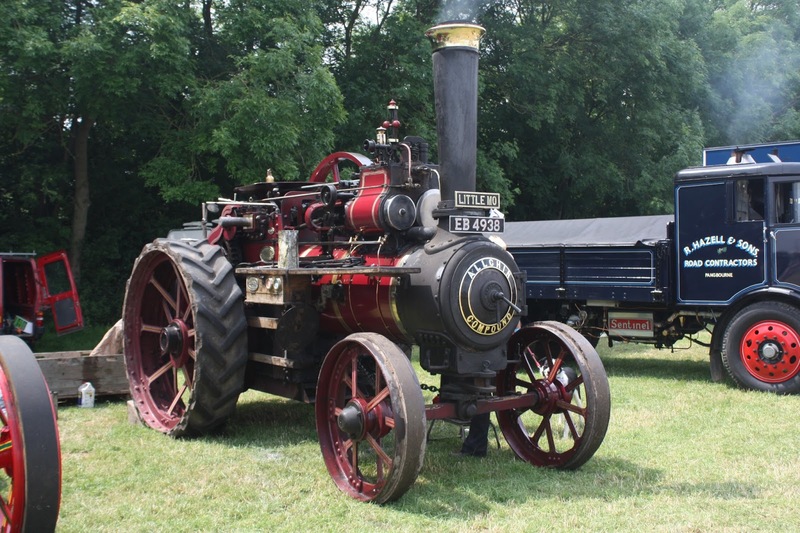 Having spoken previously about the variety of objects that end up in Loch Ness, a reader enquired further about the steam tractors that found their grave in the loch. I found this when reading a lengthy comment posted on a forum in August 2012, now is as good a time as any to post that comment - especially since it now appears to have disappeared from the Web. Local readers may be able to add further details and I note the author mentions our favourite cryptid at the end (this was during the hype around the now discredited George Edwards photograph). Around 1981 I fancied getting a steam engine and phoned an owner near Kirriemuir for guidance. "Fit wiy div ye na tak the anes oot o Loch Ness?" was his question. He went on to say that in the nineteen thirties when the A82 was being realigned some old steam rollers had broken down and were cannibalised to keep others going. At the end of the contract the robbed rollers were simply pushed into the loch to tidy up. Seems the contractor involved had steamed them up from Glasgow in the first place, taking over three weeks for the journey. Just west of Clansman Hotel I found the remains of a steam engine but all that could be removed by boat had gone. A pair of front wheels rested against the gable end of a cottage in Dores. The governor weights adorned a garden in Milton but around 25 years ago a team came up from England and salvaged what was sitting half on the shore. Last year someone commented on the line up of vintage tractors at Bogbain, asking why was I not trying to take the steam lorry out of Leanach quarry, up by the Keppoch. Seems that when divers had been searching for Renee MacRae in the quarry in 1976 a diver reported seeing a steam Foden in the depths of the flooded quarry. The English team made enquiries but were told to bugger off, this area was now in someone's back garden. John MacKenzie of Achnagarron tells me that he used to see the steam lorry sitting beside a croft beside Culloden Station around 1960. I hunted down local divers with a trail leading me to Frank Allan and then on to the late Jimmy Kelman. No, Jimmy had not been involved but back a long time ago the great John Oak had bought a barge down in Corpach and been quoted mega bucks to bring it home to Inversneckie. Jimmy went west with his welding gear and welded brackets on the barge to take two outboard motors. Coming through Loch Ness, Jimmy stopped to have his flask and sandwiches and as he rested on the land side of the barge, there in the water, below the surface, was a steam engine. So guess who got on a jet ski and headed for "the point in the loch below where the piper used to play for the tourists", according to Jimmy. Seeing nothing from the jet ski I then got a loan of a cabin cruiser and using a friend's home made underwater camera, I trawled the area for days but could find nothing. Then news reached me from the Jacobite Cruise office that I was in the right place because one of their men reported seeing wheels above the water whenever the Loch was low. I phoned Adrian Shine to find out where I'd get a good copy of a survey of the loch. "The library", says Adrian, and there is a grand survey which was done by Sir somebody or other in 1902. The library was no use but bumping into a friend and telling him my mission into the city centre on a good working day my friend says "Phone Mike the bike, he has a copy". Mike arrived with his bike and unscrolled the most beautiful detailed survey that anyone could imagine. Seems Sir so so had done it all with piano wire and lead weight and according to sonar he was spot on with his findings. The survey showed that water on the north side of the loch was shallow, meaning that any engine dumped there would not have gone down 600 feet. I gave the survey to George back around March asking him to have a go and now he seems to have found some part from the salvaged steam engine near the Clansman. The search continues. 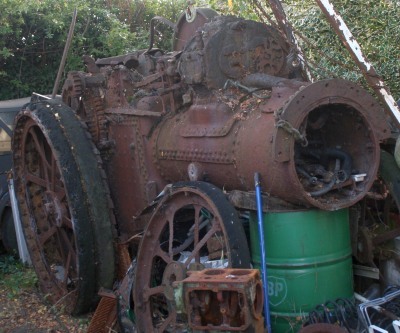 But three trips to South Uist earlier this year proved fruitless while looking for a steam roller that ran off out of control while being unloaded from a Ministry of Transport lorry during the last war. Probing with metal rods, a metal detector, and even using a magnetometer from a local firm that guides oil drilling in Canada, I have detected nothing. It seems we were in the wrong bog around Bornish. Leaving South Uist the last time, I ran into my friend at HEBCO who has been very helpful and I listened again as he repeated "the man that used to tell us all about the engine used to say. "I'm the only person who knows exactly where the engine is". This suggests it took off out of sight of the public road and over the years the location has got mixed up. I should be over there at this moment because the bogs are at their driest in years but can't get past Torvean. I know of two ladies who have recently seen the same sort of thing as Mr Edwards in the Loch, quite near Dores Inn but no way would they ever go to the press with the news for fear of attracting the ridicule that we see on this page today. "around 25 years ago a team came up from England and salvaged what was sitting half on the shore.". The traction engine came from the shores of Loch Ness, it fell in while a road was being made along the side of the loch. It was recovered over 20 years ago via a raft made of scaffold and drums with an outboard motor on the back. and 2 trips in a lorry back to Abingdon. Still have the video somewhere of the weeks adventure. The phrases "over 20 years ago" and "around 25 years ago" suggests these may be referring to the same tractor? I leave it to our intrepid local tractor hunter to put a bid in (as I recall he posted under the pseudonym "Bogbain" on the Inverness Courier)! Nessie fans will recall how the extension of the Glasgow-Inverness road lead to hundreds, if not thousands of tons of blasted rock and other debris being regularly tipped into Loch Ness. The thought being that the Loch Ness Monster was disturbed from her "sleep" and embarked on a rash of surface adventures. Now I am quite happy to accept that the continuous rumble of rubble did disturb the cryptid as I am of the opinion that the creature is not an open water creature, but one that largely spends its time amongst the submerged sides of the loch. These areas would have been particularly exposed to these torrents of rock. Having said that, it is more likely that the opening of the road and the cutting back of the lochside vegetation that made it more likely for people to see the monster rather than the underwater disturbances. I see I have now posted successively on three subjects which are not cryptid related. Back to Nessie now, but a knowledge of the local history around the loch adds to the interest in the area as well as potentially proving useful in Nessie forensics. I think I will add a "Local History" side bar to the webpage.